Our mission statement, Green Acres School challenges and inspires students to live and learn with intellect, curiosity, determination, joy, and compassion, encompasses our core values as a school. The Service Learning Program is designed to align its approach more intentionally with our mission statement. We help our students to focus more on the quality of their volunteer work by giving them service experiences during the school day and offering guidance in their service work outside of school. Reflection is at the center of the program and will be ongoing as students negotiate a variety of experiences and feelings in their quest to help others. Depending on the grade, students are asked to complete a minimum number of outside-of-school service experiences, preferably with the same organization. What is an outside-of-school service experience? This is a volunteer experience after school or on a weekend that helps a nonprofit organization. 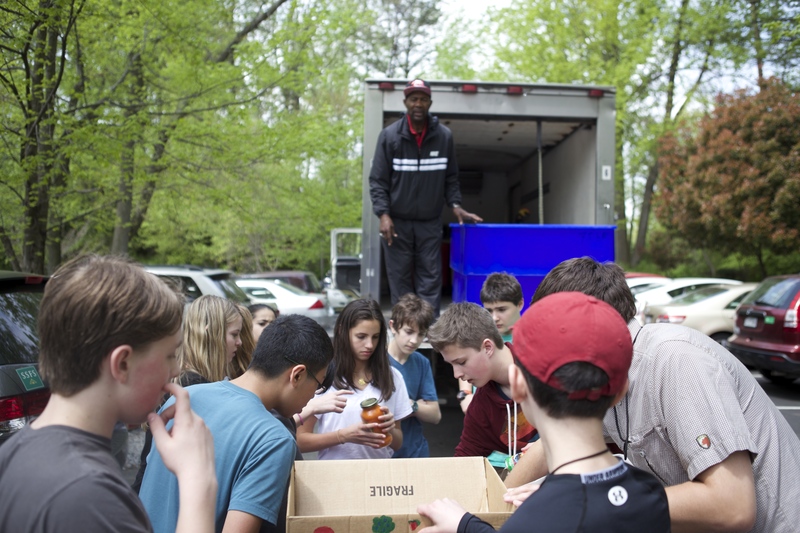 For example, an 8th grader volunteers at Central Union Mission in Washington, D.C. by preparing sandwiches, or a seventh grader helps to clear debris from a Montgomery County trail or park through their volunteer program. Our Service Learning Coordinator Kara Combs is available as a resource to help families find the best volunteer experience for their children. Students in 6th-8th grades also complete at least one project that gives back to Green Acres in some way. We believe it is important to serve the community-at-large, as well as your own school community. The projects are impressive in this area. Some of them include serving as Student Ambassadors at our Admission events, sorting and organizing Lost and Found items, reading with students in Lower School, and watering the campus gardens. Kindergarten: Winter Coat/Hat/Gloves drive; Kindergarten students collected and sorted several boxes of donations to benefit National Children’s Center. 2nd: Terry’s Soup: to honor our late colleague and philanthropic pioneer, Terry Strand, 2nd grade students continued the tradition of making soup to donate to The Lord’s Table at St. Martin’s Church in Gaithersburg, MD. Second grade soup making days correlate directly with the second grade math curriculum. 4th: Our 4th graders are our oldest students in our Lower School. To draw on their emerging leadership skills, the fourth graders lead the annual food drive to benefit Manna Food Center. The 4th graders are charged with the organization, publicity, and sorting of all the donated foods for the entire school.